Etymology: < medieval Latin volvella or volvellum, apparently < volvĕre to turn. An old device consisting of one or more movable circles surrounded by other graduated or figured circles, serving to ascertain the rising and setting of the sun and moon, the state of the tides, etc. 14.. MS. Ashmole 191 f. 199, The Rewle of the Voluelle. Now folowiþ here þe voluelle that sum men clepen a lunarie. c1440 Astron. Cal. (Ashm. 391) Now folowiþ þe thrid table þt is cleepid a voluelle or a lunary. 1501 in C. L. Kingsford Chron. London (1905) 239 A Costlew pagent wt a volvell by the which the xii signes moved aboute the Zodiak..and ouer that voluell Sat, in a stage or pynnacle, Raphaell the Arch angell. 1843 A. Dyce in J. Skelton Poet. Wks. II. 336 A curious description of the volvell, with directions for its use. 1865 Athenæum 18 Feb. 233/2 One volvelle and an accompanying table do the work quickly enough. 1884 Manch. Examiner 16 Sept. 6/2 A curious Kalender, with an astronomical volvelle of which the stylus had been preserved. I vaguely remember having a verb-table one for… French?… when I was in college forty-odd years ago. We have blundered upon some in our wanderings; but can I find the photos? No verb tables, French or otherwise, in this quarter. But indeed a proportion wheel for scaling photos prior to printing in a newspaper or brochure. Still with me, though it’s been a long, long time since I’ve used it . . . the numbers may even be represented by Roman numerals. What is amazing to me is the amount of thought that went into encapsulating knowledge in such an ingenious form. Getting websites to incorporate and present similar material in a similar way is an exercise in utter frustration. I had and used a volvelle (though the term was not used) in my air force days, back in the fifties. Did it have to do with dead reckoning? God, the things the mind forgets (many)! Reminds me of the circular slide rules. I had one in the early 60s, I think it was a Pickett. I didn’t know they had a name. Thanks! I like that two of the references in the OED use the word ‘curious’, which a volvelle is. The best circular slide rules were the effects of nuclear weapons slide rules, which could handily tell you the crater depth, speed of flying glass, the death rate from radiation sickness, and other such jollities, given your distance and the blast yield and its height. Your “Verbwheel” is still available from an outfit in the hills outside Bonn. 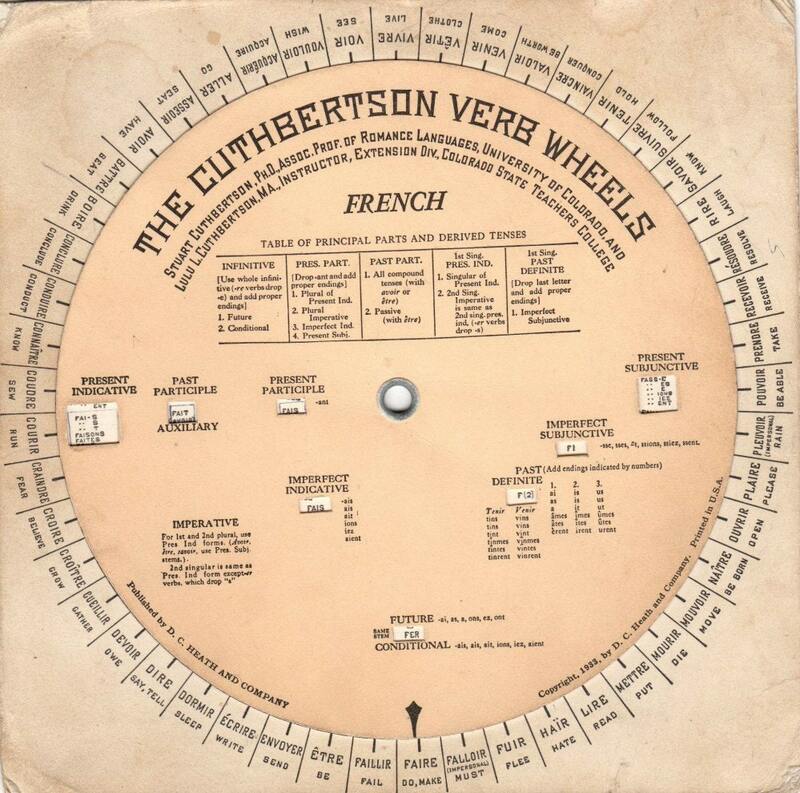 There used to be fairly popular Cuthbertson verb wheels. There were German and Spanish, too. Related: Sam Loyd’s once-famous “Get Off The Earth” puzzle, whereby 13 human figures become 12 when the dial is rotated. There was another analog information device I used to have, in the form of a tree identification guide from the 1950s. It was a deck of cards, one for each species, with a list of questions (e.g. “Are the leaves divided into leaflets?”) and next to each one a hole for “yes” or a notch for “no”. You’d go through the list and every time you could answer “yes”, you’d put a pin through the hole/notch and shake the deck so that all the noes fell out. At the end, you’d hopefully have no more than two or three cards left and would look them up in the accompanying book to decide. Perhaps you’re thinking of the McBee spindle? More on McBee cards here, with a comment from someone using the same tree guide, only a couple of years ago. I’m Italian, from Romagna to be precise. Romagna is not a recognized administrative region rather is an area bounded by its ancient roots, as it was once inhabited by the Etruscans and Celts (Boi and Senoni) before the appearance of the Roman Empire. In today’s local dialect it is still on words of Celtic – Etruscan root . We were discussing with friends on the etymology of the dialect term “invel” which means “nowhere” . I thought he had a derivation from the Gaelic and yet now I think that the origin is this just demonstrated. Thanks to Google, I found a very interesting forum. Interesting; I googled [“invel” romagna] and got a bunch of hits, with expressions like “non lo vedi invel” from “Chênti a la dstesa” (in Atti e memorie – Deputazione di storia patria per le provincie di Romagna, 1886, p. 412) and «Vo a l’avdìv invel la curè?» (in Fiabe di Romagna, Vol. 1, 1993, p. 248), but couldn’t find an etymology — just an author calling for someone “che sapesse rettamente dimostrarci donde proceda lo strano invel, che equivale precisamente a in nessun luogo” (Il propugnatore 6 , p. 328). There is a short explanation of invel at the bottom of column 2 on page 10 of this number of the periodical La Ludla (anno XV, gennaio 2011, n. 1), under the heading “In nessun luogo”. Maybe I’m dense but I reread the thread and didn’t get the Celtic etymology for invel. But it’s interesting anyway. And what about veg? Yeah, I don’t understand how	phileas came up with the Celtic thing, but I’m glad they found the thread! In italiano antico esisteva ovelle ‘in qualche luogo’ dal latino UBI VELLES ‘dove vorresti’. Da un’espressione simile viene il dialetto invél (indvél) usato solo in frase negativa: un s trôva invél ‘non si trova da nessuna parte’. Etimologicamente bisognerà risalire ad un IN DE UBI VELLES ‘in dove vorresti’. Da VELLES dovremmo aspettarci dal punto di vista dei passaggi fonetici una e aperta *invël e non invél: la “chiusura” della e si spiegherà con l’influsso lasciato dalla caduta della vicina i di UBI. I hope phileas comes back and sees it!